La orden para el WZ-132 fue firmada en 1964. El diseño estaba basado en el WZ-131, pero con el objetivo de mejorar la potencia de fuego y la protección del blindaje. Unos cuantos prototipos fueron construidos antes de que se cancelara el proyecto a finales de los 60. Todos los prototipos fueron destruidos durante las pruebas de armas nucleares chinas. Other than missing a drum loader, the WZ-132 has a few benefits to the AMX 13 90 in some ways as a combat vehicle. Compared to the AMX 13 90, It's able to make sharper turns without losing speed, has a more accurate, slightly higher penetration and faster aiming gun, which is also more accurate when firing on the move. 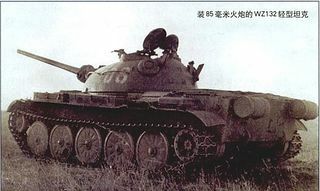 The tank also possess sloped frontal armor and turret, which might bounce enemy shells sometimes. However, the AMX 13 90 has the aforementioned autoloader (burst damage, very important with hit and run tactics) and a smaller profile (better camo rating/harder to hit). The WZ-132 has a great gun choice. You can either play with the more well-rounded 85 mm 64-85TG or the more damage-oriented 100 mm 60-100T. 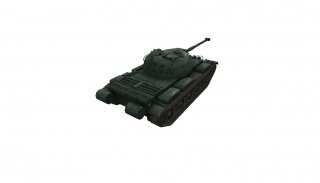 Should you select the former your tank will be more accurate, and have a substantially better rate of fire and DPM. Should you select the latter, you will have more penetration, more alpha, and APCR instead of HEAT. 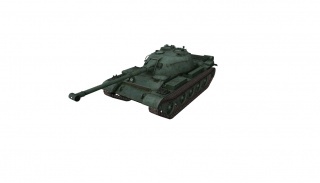 The 85mm gun lets you play more in the role of an agile and accurate supporting light tank. The 100 mm lets you perform like a speedy but poorly armored medium. 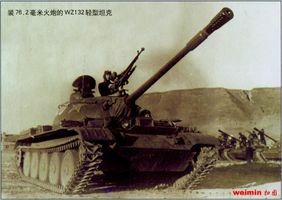 A WZ-132 driver should avoid fighting autoloader tanks, especially the AMX 13 90 and the M41 Bulldog in any sort of brawl because of the latter's feared drum loader. Assuming neither tanks miss, they will be able to destroy or critically injure the WZ-132 in mere seconds. The key to beating an autoloader in the WZ-132 is to make use of the tank's agility, on the move accuracy, and sustained DPM. Staying at a distance (~50-100m) and keeping in motion when in an open area will often make the opponent miss their shot, while letting you fire accurately in return. Once their drum has been depleted, the WZ can easily kill it during its much longer reload time. 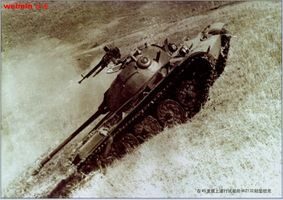 Should most other tanks try to turn in a long curve, the WZ's superior agility will let it close the distance very fast. 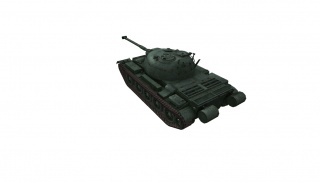 However, with the addition of new light tanks, the WZ-132 has become out-matched as a "medium-like" light tank. 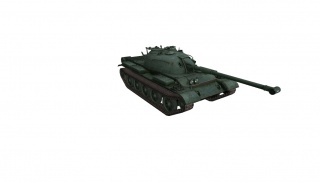 When compared to the RU 251 the WZ-132 has far less DPM and is much slower, and in comparison to the T-54 Light-Weight it has far less protection and shell dispersion rate. While the WZ-132 in itself is by no means a bad tank, it has simply become out-matched when it's compared to it's "medium-like" light tank competition. You must research the upgraded suspension in order to mount anything else. Once you have researched the upgraded suspension, research the upgraded turret if you have researched the 100 mm 59-100T from the WZ-131, if you have not; research the 100 mm 59-100T and then the turret. If you want a faster reload, use the top 85mm gun until you have enough exp for the Tier 9 100 mm 60-100T. Now go for the Tier 9 100 mm 60-100T, as it will greatly ease the grind on the WZ-120. The last engine doesn't improve the engine power, instead it increases the module hit points by a considerable amount, which can be useful combined with a removed speed governor. It's recommended to research this module last.